​​Extra fuel tank for the Land Rover Discovery LR3 and LR4. Up to 80L extra fuel. Relocating the spare wheel is necessary. Is this tank correct for diesel models or petrols or both ? 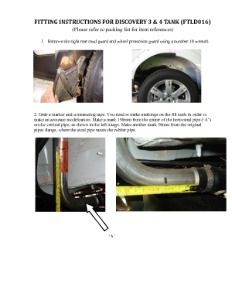 Does this reduce the ground clearance of the vehicle or the departure angle? Good news! The tank is angled, and will not reduce the ground clearance. Can this be fitted to the L320 RRS 2006 - 2013? Yes, our Land Rover Discovery LR3 & LR4 Auxiliary 80l Fuel Tank can be fitted to the Range Rover Sport 2006 -2013 model. Is there any way of determining the level in the Aux tank? How do you know when it is empty / full? Do you have to pump fuel from main tank to fill the aux tank or is this automatically done when filling up? The system cannot pick up the extra fuel volume, so the fuel trip meter will not be accurate with the distance to go. When filling, both tanks will fill the same time, and when the fuel in the aux tank is needed, you need to pump the fuel from the aux tank to the main tank. 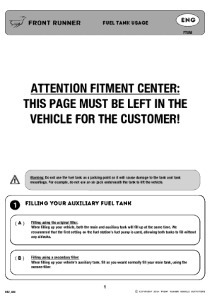 How does this supplementary tank work in conjunction with the fuel supply indicator on the dashboard? Does the tank come with all additional fuel pipes and fill pipe or are there additional fittings etc which are required? You mention that you use the main fuel gauge to determine remaining fuel level, how is this achieved. Does the fuel pump in the aux tank pump continuously into the main tank until the aux tank is dry? The discovery fuel tank comes complete as a full kit which includes all necessary piping. The tank will only pump over once the pump is switched on with the switch mounted in the vehicle. When your primary tank is depleted you can manually switch the pump on and the vehicles fuel gauge will adjust accordingly once the fuel is pumped into the primary tank. Does the tank came with a extra fuel pump or does it use the factory fitted fuel pump? How do you know the fuel level of the tank? Does it come with an extra fuel level? This tank comes with a pump that allows you to pump fuel into the original tank as well as out of it and into the auxiliary tank. You would use your vehicle's original fuel gauge to keep track of the remaining fuel. Is this tank suitable for the model with the petrol engine? Yes, the tank does fit on petrol models as well.